Reunite a family, separated inside an Egyptian museum. A young family is invited to visit a newly opened museum in Egypt; while touring the museum they discover the long forgotten tomb of a cursed Pharaoh named Raned. Then the family becomes separated! Play as each character as you help the family to reunite. 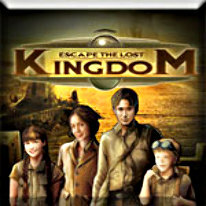 Escape this long-lost Egyptian kingdom and discover the story behind the fascinating tomb and treasures buried within.